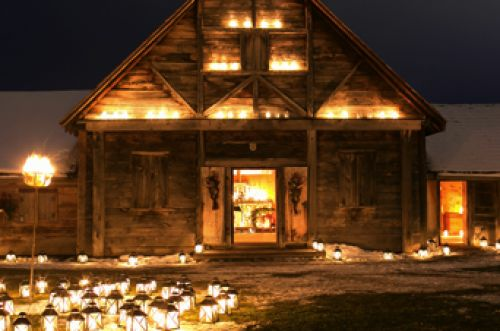 Now in its 19th year, Sainte-Marie's "First Light" is a must-see event with a great line-up of family activities and performers, all amidst the spectacular glow of over 5,000 candles. The magic begins when visitors approach the candlelit historic site, as a beautiful amber glow illuminates the famous 17th-century mission. A colourful historic encampment will greet visitors, set up by the popular "Survival In The Bush" group. Visitors can then stroll the candlelit paths which lead to a variety of fun family activities. The cookhouse is filled with the sights and smells of delicious baked goods and cookie samples available for tasting. Historic blacksmithing will also be demonstrated, and a Nativity creche will be on display in the stables near the Farmer's Dwelling. Always popular with little folks, corn husk doll making will be offered in the Sainte-Marie foyer.